The Tennessee Valley Authority (TVA), created in the 1930s during Franklin Delano Roosevelt’s sweeping New Deal governmental reforms, has long marked the landscape of the upper south and controlled the waterways that run throughout Tennessee and portions of its bordering states. Controversial even at its inception, TVA grew to become the largest public power agency in the United States, combining social welfare goals with technological innovation and regional modernization. What began as a social uplift project for a depressed Tennessee Valley has, over many decades, devolved into an underfunded agency unable to adequately maintain its numerous dams, visitor centers, and recreational spaces. In Dangerous Waters, documentary photographer Micah Cash uses his keen eye to highlight the beauty of TVA’s vast architecture and brilliant engineering, but also its tenuous relationship with environmental stewardship and intermittent neglect of the social goals upon which the agency was founded. Cash illustrates TVA’s contradictions through poignant shots of the agency’s locations. He starkly captures, for instance, the artificial juxtaposition of beach sand at the shores of Douglas lake or the monumental infrastructure of South Holston, foregrounded by local gravestones. Cash’s photographs also depict the increased security measures of a post–9/11 world, as many dams, visitors’ centers, and scenic vistas are now blocked by haphazard fencing, bolt locks, and warning signs, further alienating would-be visitors. The conflict represented within each image mirrors the battle TVA must fight as an agency: to further its development of the Tennessee Valley and, at the same time, preserve both the agency’s original vision and the natural environment of the region. It is a challenge TVA must surmount, but continued budget cuts, a sometimes disinterested public, and the War on Terror have made the fight more difficult. 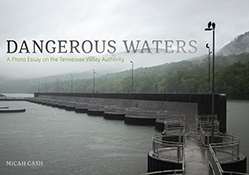 Replete with color images and essays that are both personal and probing, Dangerous Waters deftly illuminates TVA as a complicated force operating within the Tennessee Valley and beyond. Cash’s photographs beautifully showcase the dual reality in which TVA operates, and this book is sure to captivate readers and reignite a conversation on the direction of TVA. Micah Cash received an MFA in visual media from the University of Connecticut and most recently taught at Wingate University and the University of North Carolina, Charlotte. His photos and essays have appeared both on the web and in print in The Atlantic, The Bitter Southerner, Aint-Bad Magazine, and Places Journal, among others. He has exhibited his photography and paintings at numerous locations around the country, including Atlanta, Washington, DC, and New York City.